How is the Second Floor of a Home Framed? The second day of framing sees the rim board� for the second floor installed. The second floor is constructed by a series of “joists” or long I-beams made from Engineered wood and OSB, connected to the outside walls and load bearing members that carry the weight of the house. The entire floor is between the ceiling of the first floor and second is quite thick and will contain the pipes, ducts and wiring for the first floor ceiling and the second floor. These joists are then covered in sub-flooring made of OSB to make a stable platform for the second floor of the house. Temporary steps are installed so that the work crews can easily access the new second floor. The second floor of the house can be as important as the first floor of the house. This is because this is where rooms such as the bedrooms and bathrooms are typically located. In some cases, this is also the part of framing where the attic is. An attic is a place where people usually store seasonal items that are no longer used inside the house. The walls are usually framed with members, which are also known as studs or wall plates and lintels. These are used to improve the lateral strength of the walls that are built on the second floor of the house. Aside from this advantage, the members or studs are used to improve the horizontal strength of the walls. Aside from the wall studs, you also have to place reinforcements along the flooring and the walls of the second floor. Usually, this is done by applying plywood panels that are positioned parallel and perpendicular to each other. To further strengthen the attachments of the plywood with each other, you have to apply joints with bolts and nuts. Ideally, the joints of the wooden paneling for the second floor should be three jointed to add reinforcement to the entire skeletal structure of the plywood. Aside from this, you may place heavy-duty glue between the wooden surfaces. To construct these types of frames around the walls, you have to set up the entire framing over a stable foundation. The construction of the second floor framing is similar to that of the first floor. The only difference is that the framing of the second floor is somewhat suspended over the first floor framing and reinforcements. This allows the second floor framing to have additional support aside from the main foundation that this floor has. The foundation may be initially created using wide beams for the main form of the second floor. This ensures that the form is well defined and the reinforcements can be rested upon a support that is strong enough to take on the total weight of what comprises this floor. The total weight that the foundation should take up not only consists of the weight of the reinforcements and the other attachments of the framing. The wide beams should also take up the load on everything on the second floor. This also includes the weight of the people who will be occupying the second floor. The foundation can be reinforced by placing concrete and hollow slabs on the flooring of the second floor. This is to ensure that the foundation can take up enough weight. Usually, the concrete and hollow slabs take up more than 24 hours to dry. Because of this, you have to place protective equipment around the area to prevent the intrusion. The intrusion can disrupt the drying process of the combination, which can lead to a delay in the entire building process. 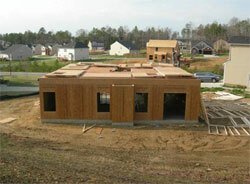 It is important to adequately plan how you will structure the framing of your second floor. Another problem that you may encounter when you do not plan properly for your home construction is the risk of having damage to your home. This can include the presence of cracks on walls and ceilings. Do yourself a favor and perform planning before you start with the actual framing. A proper layout of your second floor will not only be safe and secure for your home, but will also make everyday living easier. It would be beneficial to meet with an architect to discuss your ideas of a second floor layout. The architect will be able to tell you if your ideas are feasible for your home construction project.